"Pronounced just like it's spelled." Yeah, I know. Where does all this Orchestra Luna stuff come from? Well, I've been fortunate to have former band members share information and photos with me, as well as their memories of the time they spent with the band. In this case, however, I was able to obtain an acetate demo copy of the ORIGINAL LP from Last Vestige Music in NY. This is the album as it was intended for release in Fall of 1974. However, Bruce Lundvall of Epic Records directed that the album be changed to include two songs he liked. This acetate version, cut directly with a cutting lathe from the original master tape, is a rarity. Read all about it and see pictures on my OL Acetate Demo Page or start with my Main OL Page! I just happened to be driving through Colonial Heights, VA, a couple weeks ago and stopped by to take a look at our old house and the high school. Much to my surprise, when I got home later that day I found that I had an e-mail from a high school friend who I had not seen or heard from in over 30 years. This motivated me to pull out some of my memorabilia from that period, including football game programs, the commencement program, and issues of our "underground" newsletter. I scanned these in and created a website for the CHHS Class of 1971. Check it out here. Since then, I've been in touch with several classmates and we've made a concerted effort to update contact information for all those who were members of the Class. 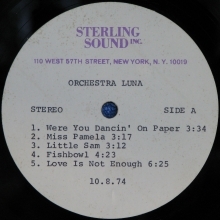 Orchestra Luna album reissued on CD by Market Square Records!! Until recently, Orchestra Luna's eponymous album was available on CD only as a Japanese import. In July of 2007, UK-based Market Square Records reissued the album on CD and it is now readily available from Amazon and other sources. The nicely-packaged CD includes additional artwork, publicity pictures of the band, booklet notes by John O'Regan, and historical commentary by Rick Berlin himself. Though the import CD is relatively expensive from most sources, this is definitely one that you want to pick up. Market Square has done a beautiful job and deserves many thanks. When I was young, I knew nothing. Then I learned something and soon thought I knew everything. (This was especially irritating to my parents.) Now, I realize that I still don't know much. But I have unbounded admiration for people who actually do know something and who try to share it with others. I cannot argue with anything stated on this site dedicated to personal wisdom: MyPersonalWisdom.com. As many of you already know, my wife, Elizabeth, passed away in September of 2006, after eighteen years of marriage. She was diagnosed with a brain tumor in January of 2004 and fought it courageously for over 2 1/2 years. Thanks to my family, her family, and my many friends, I was able to make it through a very difficult period. Elizabeth would have wanted to be remembered for her bright personality and beautiful smile. If you would like to view some photographs of Elizabeth during happy times over the years, go here. If you were a friend of Elizabeth's and have any pictures of her that you would like to share, please let me know. To quote the venerable Popeye, "I've had all I can stand, I can't stands no more!" Been looking for a set of portable speakers to take when you travel?. Two years ago, you could find many models from different manufacturers at reasonable prices. Now, you are expected to pay twice as much for speakers designed to work with the many flavors of iPods. Oh, sure...they will connect to other portable audio players, but you end up spending a lot of extra money on unwanted features, like the iPod docking port and remote control. Here are 10 reasons I don't care for iPods. Dubbing VHS tapes to DVD? Having problems with worn tapes? Why don't you think about using a time base corrector (TBC)? Broadcast quality TBCs cost thousands, and even consumer-grade units are usually at least a grand. Worn video tapes and misaligned playback heads can combine to give you poor results when you try to make a DVD from a tape. Let me show you how to identify some common VHS video capture problems that a TBC can reduce and tell you how to get a TBC for less than $75! And here's another page to help you make quality DVDs from your old VHS tapes. The most complete Orchestra Luna website! Recent additions include a new picture of Liz and Karla performing in 1977 and an original of the privately-printed OL Anthology from Summer 1977, listing their repertoire and the band members. There are also some images and comments on my newly acquired copy of the 1975 OL single, "Heart". Be sure to look at my Orchestra Luna Biographies page, my Orchestra Luna FAQ page, and my OL Image Index page. Of course, I still have my original "Orchestra Luna" page here. Check them all out! UPDATE, August, 2005! Still working on Deep/ Wreck diving certification! I've been diving some wrecks off the NC coast. 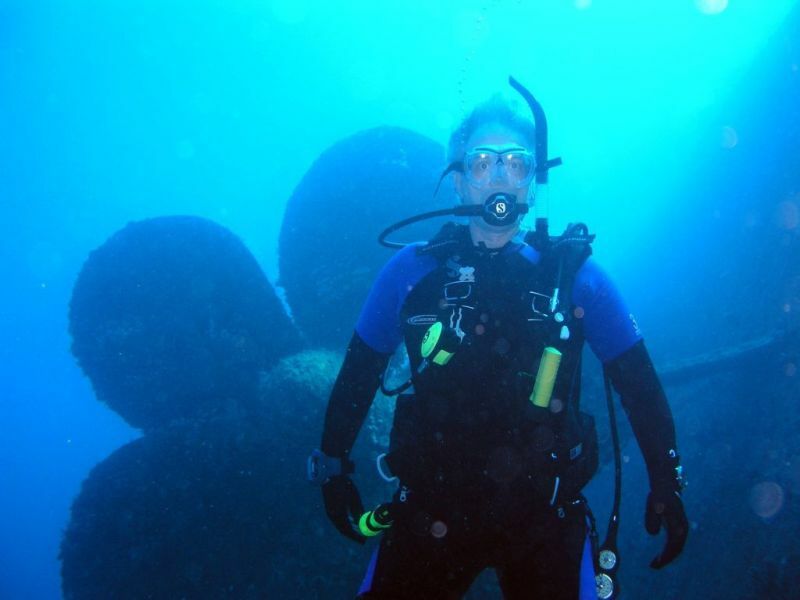 This year, I was able to dive some wrecks in Key Largo. I'm still a new diver, but I was quite pleased switching to a digital camera in an underwater housing. Take a look at the difference in quality here. Is Celine Dion Really The Devil?? Judge for yourself!! I've had my suspicions about Celine for many years now. There's too much going on with her personal life, her career, and her fans. For a woman with such a soaring voice, but no musical taste or sensibility, she has gone way too far for her success to be explained in any normal way. So I've taken a hard look at some evidence you might find interesting. 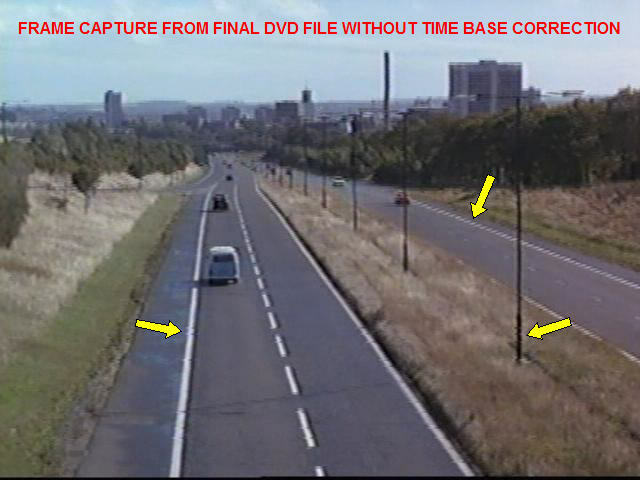 Also, some contributors have sent me additional evidence, which is now here. Do you HATE this song? All of us have a song or two that, when we hear it, makes us want to push knitting needles into our ears. But, quite inexplicably, millions of other people seem to love them! Here's my collection of The Worst Popular Songs. To keep it interesting, I even have a page of "close-calls"...songs that I had to reject because they were a little too good. Take a look at both pages! Give until it hurts! So far, you have ignored my plea for donations to further the cause of 4ourism. Check out my 4ourism page and my testimonials to 4ourism page to see why you should send money. If you're a bit skeptical and don't know whether I'm being honest with you, check out my "Do You Believe Me" Quiz page. You'll have an opportunity to take a self-scoring quiz to judge my trustworthiness. Plus, you'll learn what some other people actually believe. UPDATED NOVEMBER, 2003!! I've spent a lot of time figuring out how to make good CD's from vinyl albums and cassettes. If you would like even more details on the process, go to my FAQ page. You don't need to spend much money to do this, but you do need to know a few secrets. Your homemade CD's won't sound as good as professionally-produced CD's, but they'll be close. I've put together some pages with photos and thumbnail indexes. If you would like to see some photo albums of snow, our vacations, Glade Valley School, the weasels, or diving, then check it out. I also have a FAQ for this web site here. By the way, did you know that everything is four? It's Richard Thompson! - I am a Richard Thompson fan. Yeah, yeah, I know..."Who's Richard Thompson? And why would a classic rocker like you be listening to folk-rock?" Trust me...you need to check him out. If you would like to learn more about RT and how I came to start listening to his music, check out this page. I even have a page of suggested RT albums, a page of assorted RT works, and a memorable RT story. Reissued on CD in 2007! Reissued on CD in July, 2007! UPDATED and EXPANDED! April, 2008! The Weasels! UPDATED April, 2007! Making Quality DVDs From Your Old VHS Tapes! Using a Time Base Corrector to Dub VHS Tapes! Pictures from Wreck Diving Off NC and in Key Largo! Letters to the Unterzuber.com Webmaster! Dubbing Albums to CD FAQ!! Is Celine Dion Really The Devil? Dubbing Vinyl Albums and Cassettes to CD!! Scout: Before and After Pictures! A Kayak Trip to Portsmouth Island!! Kayak Camping at Bear Island! !